In that statement at a Vancouver, B.C., press conference in August 1957, Elvis Presley acknowledged the influence spirituals had on his music during the early years of his career. Although then at the height of his rock ’n’ roll popularity, he had already recorded what are commonly called his first “gospel” songs. Elvis continued to record religious music intermittently throughout the rest of his career. 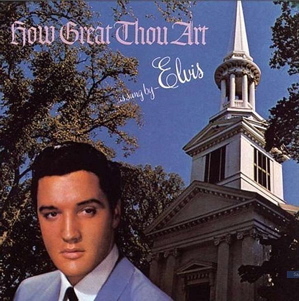 Elvis’s second gospel LP, How Great Thou Art, featured 12 new recordings when it was released in March 1967. A year later, another Easter single, “You’ll Never Walk Alone”/“We Call on Him,” was issued. Those two songs also appeared on Elvis’s third gospel LP, You’ll Never Walk Alone, a budget LP released in March 1971. Of the nine songs on that album, only two had not been previously released. They were movie soundtrack songs, “Sing You Children” from Easy Come, Easy Go, and “Let Us Pray” from Change of Habit. Just a month later, Elvis’s fifth gospel single, “Life”/“Only Believe,” came out. 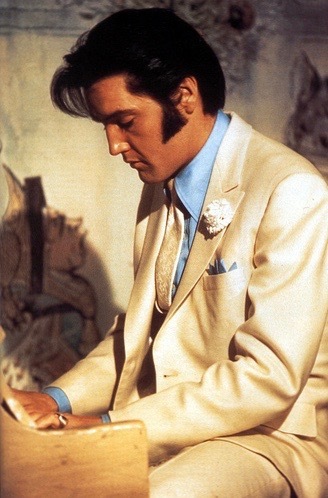 In Easter season 1972, RCA issued Elvis’s last gospel single, “He Touched Me” / “Bosom of Abraham.” Those two songs were also tracks on Presley’s last gospel LP, He Touched Me, available in April 1972. These were not the last recorded gospel numbers that Elvis recorded, however. Over the next five years, gospel cuts, like “Help Me” and “I Got a Feelin’ in My Body,” were included on his regularly released RCA pop LPs. Also, live recordings of “How Great Thou Art” and “Why Me Lord?” appeared on concert LPs released in the mid-seventies. In all, about 60 Presley gospel recordings were released in one form or another during his lifetime. Choosing the 10 best is, of course, a very subjective task. Here are my personal choices in countdown order. 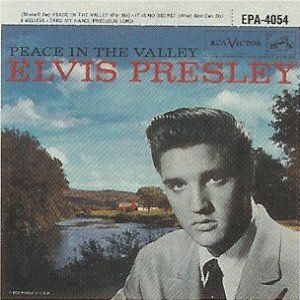 Elvis recorded “Peace in the Valley,” the title song of his first gospel record, in Hollywood on January 13, 1957. He had sung it a week earlier during his final appearance on The Ed Sullivan Show in New York. Elvis’s delivery on the song was not as polished as it would be during his 1960 gospel sessions, but his commitment to the song and its message helped to soften much of the public criticism he had received up to that point. 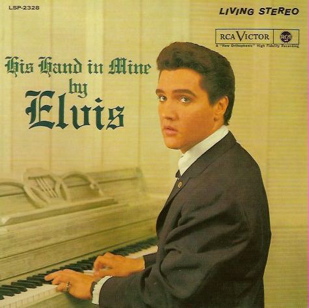 This has always been my favorite track on Presley’s 1960 gospel album, His Hand in Mine. “After rehearsing it a few times, he was ready to roll tape,” claimed Gordon Stoker in the sleeve notes for Elvis’s I Believe box set. “Listen to it; those words are not easy.” The vocal blend with the Jordanaires was seamless on the up-tempo tune. It took a few takes to get the timing and tone of the five individual voices right at the song’s end, but when they did, the recording concluded with an inspiring flourish. Elvis often warmed up for his recording sessions by gathering his backing vocalists around a piano and singing spirituals. So it was natural that he began his December 1973 sessions at Stax Studios in Memphis with “I Got a Feelin’ in My Body,” which Ernst Jorgensen labeled a “funkily rhythmic contemporary religious number.” The song’s composer was Dennis Linde, who had also written “Burning Love” for Elvis. “It was a great kickoff for the sessions,” noted Jorgensen. “I Got a Feelin’ in My Body” appeared as one of the highlights on Elvis’s 1974 album, Good Times. 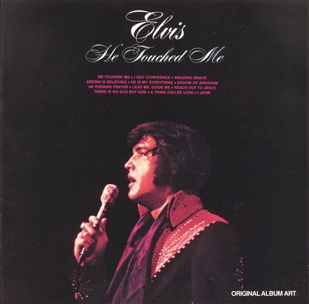 Elvis recorded “He Touched Me,” the title of song of his fourth and last gospel LP, on May 15, 1971, in the middle of a week-long series of Nashville sessions. Elvis’s life-long familiarity with such hymns allowed him to put his emotional vocal on tape in just a few takes. It also helped that “He Touched Me” was the signature song of The Imperials, who provided vocal support on Elvis’s version. Released the following year, Elvis’s He Touched Me LP won him the second of his three Grammy awards. In a 1971 Elvis radio documentary, Jordanaire Ray Walker explained the difference between spiritual music and gospel music. Spirituals, he said, come from pain and suffering, so the singer is always holding back, making the listener want more. Rhythm gospel, on the other hand, is more frantic. It has a steady beat, and the singer has a tendency to go all out. By those terms, “Saved,” which Elvis recorded for his 1968 TV special, may be his only real gospel performance. Elvis almost always left the listener wanting more, but not with “Saved.” Chasing an infectious beat, his vocal was high energy from beginning to end. Elvis wasn’t holding back, and by the end it was obvious he’d given all he had to the song. It was used on the TV special as part of a gospel medley. Elvis’s stand alone recording of “Saved” was not released until many years after his death. After a long night of recording gospel songs on October 30-31, 1960, Elvis told the Jordanaires he wanted to try “Crying in the Chapel.” Gordon Stoker recalled, “We were tired when we recorded it, but I’m thankful we don’t sound tired on the record. I never liked our ending. All of us knew we sang the wrong parts. Of course in those days you couldn’t repair. Elvis said, ‘It’s good, forget it, don’t make any difference.’” Colonel Parker’s inability to hone in on the publishing rights resulted in the recording being left off the His Hand in Mine album. Five years later, though, RCA dusted off the old recording and issued it as a single. Surprisingly, it soared up Billboard’s pop chart, reaching the #3 spot. 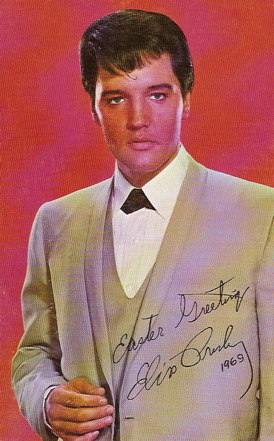 Presley’s beautiful rendition of the well-known hymn became the most commercially successful of all his gospel records. Although “How Great Thou Art” became Elvis’s favorite gospel song, according to Jordanaire Gordon Stoker, “When we first discussed cutting it, he said he had never heard of it.” After listening to the Jordanaires sing it, Elvis decided to record it. “Neal Matthews, our second tenor, made an arrangement of it,” explained Stoker. “Elvis listened to it, rehearsed it and recorded it by memory.” According to Jorgensen, “Elvis sang with sincerity and dedication, in a slower tempo than the Statesmen’s version that accentuated the spirituality of the material and allowed him to build the song into a powerful anthem. “How Great Thou Art” became the title track of Presley’s 1967 gospel album and won Elvis his first Grammy. A live version of the same song earned Presley another Grammy in 1974. "Elvis never lost his early love of spiritual music, and it always re-emerged in the commitment and passion he put into his gospel recordings."